On Friday, when Connor got home from school, Andrea took his temperature because he said he didn't feel good. It was a bit high. We were worried it was strep or maybe an issue with his ear tubes. Andrea was able to get him squeezed in to the last possible appointment at our doctor and I took him in. They did a strep test and since they'd seen a few cases recently they also did a flu test. The strep test came back negative and I was starting to feel better until the nurse assistant came in and put a mask on Connor. 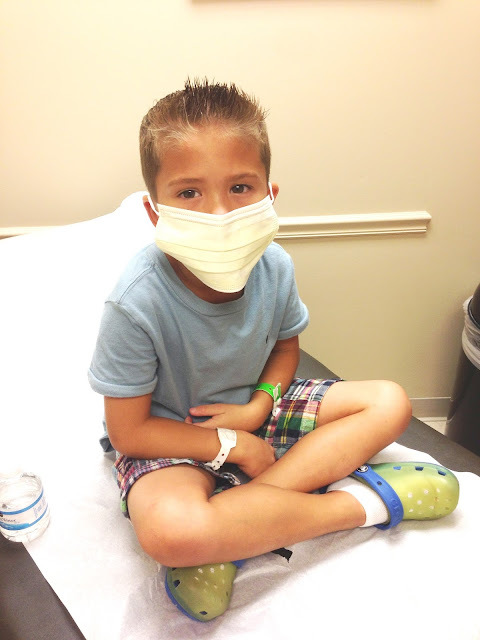 Connor was positive for Influenza A and B. We canceled our plans for the weekend and mostly stayed around the house. We went down to Daytona Beach, as we'd planned, but didn't stay the night at the condo. Just ate at Aunt Catfish and then went home. Mostly, Connor's been doing pretty well. He has been more lethargic and whiny, but he's always a good boy and it stinks to see him down in the dumps.